We’re Cajun. We cook. We feed people and we love it…it’s what we do. 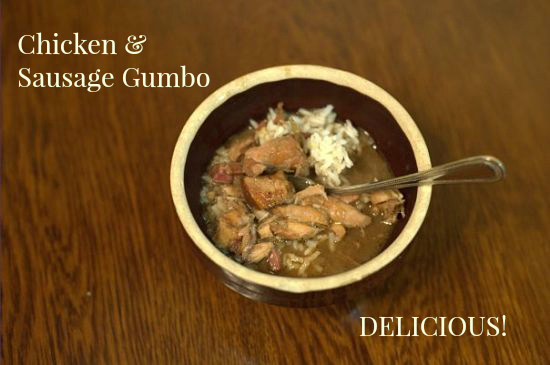 In Cajun country, cooking for others is one way we show them love. What better way to show someone you love them than to cook tasty, healthy meals for them? Now, some of us are better than others in the kitchen, but I’ll tell you that learning to cook tasty meals at home will save you tons of money and your family will become your biggest fans. I was once a strict “follow the recipe” person, but I’m learning to experiment with different ingredients and substitute what I don’t like for what things I do like in a recipe. For instance, I’m not a huge fan of curry, but I know I like thyme, so I’ll add that in place of another ingredient whenever possible. You don’t need a fancy kitchen to churn out tasty meals, but these 5 tips will help you whip up tasty meals in a jiffy. Use fresh garlic: I attended a cooking class a few years ago and the instructor said “Who uses jarred garlic?” and I timidly raised my hand. I should’ve been ashamed of myself, but I shrugged it off thinking it was warranted for the convenience factor. Yes, garlic from a jar is better than no garlic, but fresh garlic is SO WORTH IT. With practice, you’ll be able to crush a clove with a chef’s knife to get the skin to peel off easily. I haven’t mastered the smash it to bits method with your hand + a chef’s knife, but a garlic press will do a fine job if you’re too chicken to pound a knife with your fist. Quality herbs: Listen to me, folks. Stay away from the spices you find in the dollar store. Spend a few bucks on decent, fresh spices and you’ll reap the rewards in tasty dinners, I promise you. Use fresh herbs when you can get your hands on them – fresh parsley and green onions are super cheap and are used in most Cajun dishes. You can grow most herbs in pots on your patio – thyme, rosemary and mint are very easy to grow. If you’re going the dried herb route, try buying from a specialty store such as Penzey’s – their stuff is top notch. The smoked paprika is A M A Z I N G! I’ll go out on a limb and admit that I don’t like their Cajun spice blend, but I do love most of their stand alone herbs & spices. I tend to use them in my own spice blends. Good all purpose seasoning – and use it on EVERYTHING: Anyone who’s familiar with Cajun country knows that Tony Cachere’s has cornered this market for years. In the past few years, it seems like everyone has their own seasoning blend hitting the market. I’m not 100% loyal to one specific brand – I like to try different brands, but I’ll say that Slap Ya’ Mama, Tiger Dust and Louisiana Brand Cajun seasoning are all delicious as well as the good ol’ standby – Tony Cachere’s. The bonus is that you can buy Tony’s just about anywhere these days. It even showed up on a random camping trip in Montana – although the owner had no idea how to pronounce it – she thought it was Tony Cha-Cheerie’s – I had to tutor her, it’s pronounced SASH-REE. Tasso / smoked sausage: Smoked meat is delicious, enough said. If you don’t like smoked meat, what’s wrong with you? I’m totally kidding, but you’ll probably want to skip this bit of advice. If you can get your hands on some tasso, dice it up and throw that into whatever you’re cooking – it will add a delicious flavor to just about anything. The same goes for just about any smoked Cajun sausage. We add tasso and/or sausage to smothered potatoes, baked chicken, gumbo (of course) and green beans. Smoked sausage or tasso will beat regular ol’ ham any day when you add it to green beans. Trust me on that one. What are your favorite ways to jazz up your favorite home cooked meal? I’d love to hear your ideas, please post them below.